Though I have oily skin but my under eye area is very dry and keeping it hydrated is a must have for me. Spending most of the time in air conditioned room causes my under eye area to dry more and I was thankful when I got hydrogel eye patch from Skin18. There has not been a single product from Skin18 that disappointed me. If you love your skin then you must try sheet masks and eye masks from Skin18! Skin18 Luke Hydrogel Eye Patch for Wrinkles* is priced at $1.40 and you can BUY ONLINE HERE. It's the first time I had used eye patches and read on to know my experience using it! The instructions are given in both English and Korean language! To be taken care of! There are various eye patches on Skin18 and the red one is Luke Hydrogel Eye Patch for Wrinkles. The eye patches come in an easy to tear packaging and you do not need to rush for your scissors to open the pack! They are stuck on the plastic and you can easily peel them off using your fingers. iIsimply apply them on my clean under eye area and I was amazed to find it adheres so well to my skin. It does not tend to slip unlike other eye patches. It feels cool and nice on the skin. I totally loved the relaxation it gives to me! It contains hydrogel that is known for its excellent moisturizing properties. It also contains kelp, chamomile, aloe vera, marine collagen, vitamin A and E that hydrates the skin thoroughly! These ingredients convinced me to try the product without any second thought! The eye patches have to be removed gently after 15-20 minutes. My skin instantly feels refreshed and moisturizing! I loved how supple and hydrated my under eye area looks! You do not need to rinse off your skin or eyes after applying it. I then follow it up with an eye serum like Premier Dead Sea Eye Serum! - Easy to tear packaging. - Adheres easily to the skin. - Does not irritate the skin! - Your under eye area feels instantly soothing and relaxing! - Does not feel heavy or sticky! - My under eye area looks hydrated and supple! - You can even gift it to your mom! 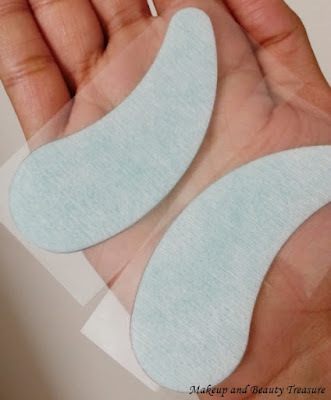 A soothing and relaxing eye patch from Skin18 that keeps under eye area supple and hydrated! I will definitely repurchase it and I would highly recommend it to everyone! - Apply the hydrogel eye patch after cleansing your skin! - Keep them for only 15-20 minutes. Do not exceed it! - No need to rinse your eyes post application! - Use them only ONCE! Do not reuse them! - Do not refrigerate it as the skin around eye is very delicate! Have you shopped from Skin18? Would you consider trying eye patches? Skin18 has lots of eye patches. I am sure you will find one according to your requirement! i agree especially when you have combination or dry skin! Do try these Pretthy! They are pretty affordable and hydrates the under eye area!